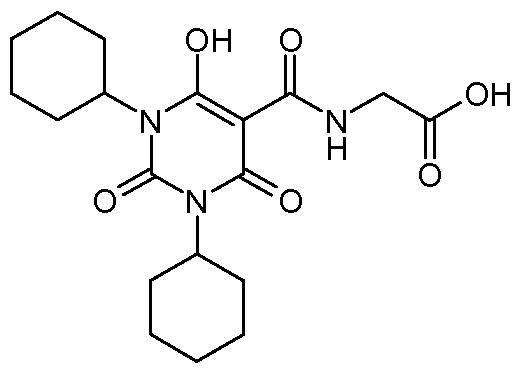 Daprodustat (INN) (GSK1278863) is a drug which acts as a HIF prolyl-hydroxylase inhibitor and thereby increases endogenous production of erythropoietin, which stimulates production of hemoglobin and red blood cells. It is in Phase III clinical trials for the treatment of anemia secondary to chronic kidney disease. Due to its potential applications in athletic doping, it has also been incorporated into screens for performance-enhancing drugs. a) 1. NaH, THF, rt 2. R1NCO, 60 0C; b) 1. NaH, THF or dioxane, rt 2. R4NCX, heat; c) H2NCH2CO2H, DBU, EtOH, 1600C, microwave. a) R1NH2, CH2Cl2 or R1NH2-HCl, base, CH2Cl2; b) CH2(C(O)Cl)2, CH2Cl2, reflux or CH2(CO2Et)2, NaOEt, MeO(CH2)2OH, reflux or 1. EtO2CCH2COCl, CHCl3, 70 0C 2.
a) OCNCH2CO2Et, EtPr’2N, CHCl3 or CH2Cl2; b) 1. R1HaI, Na/K2CO3, DMF or DMA, 100 0C or R1HaI, pol-BEMP, DMF, 120 0C, microwave 2. aq NaOH, MeOH or EtOH, rt. a) 1. CH2(CO2H)2, THF, O 0C – rt 2. EtOH, reflux; b) 1. OCNCH2CO2Et, EtPr’2N, CH2Cl2 2. aq NaOH, EtOH, rt. a) 1. 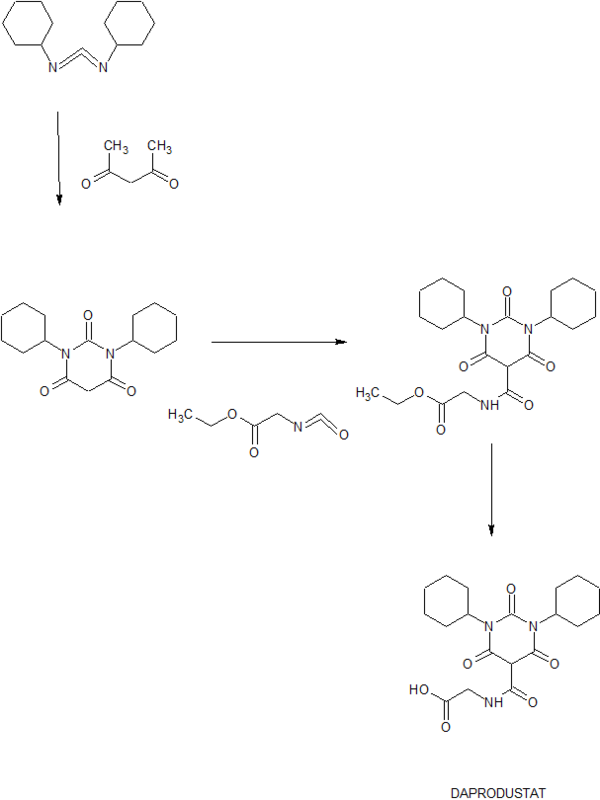 Phthalimide, DIAD, PPh3, THF 2. (NH2)2, EtOH, reflux. a) Ac2O, AcOH, 130 0C. 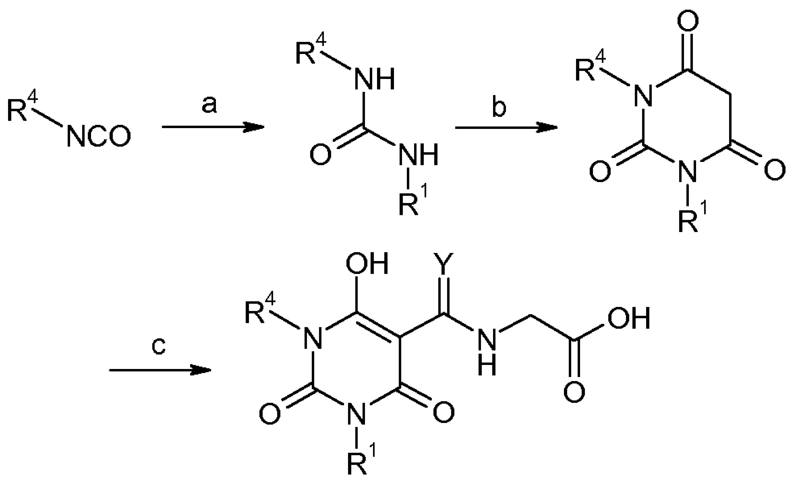 18.2a) 1.3-Dicvclohexyl-2.4.6πH.3H.5H)-pyrimidinetrione. A solution of N5N- dicyclohexylcarbodiimide (254 g; 1.23 mol.) 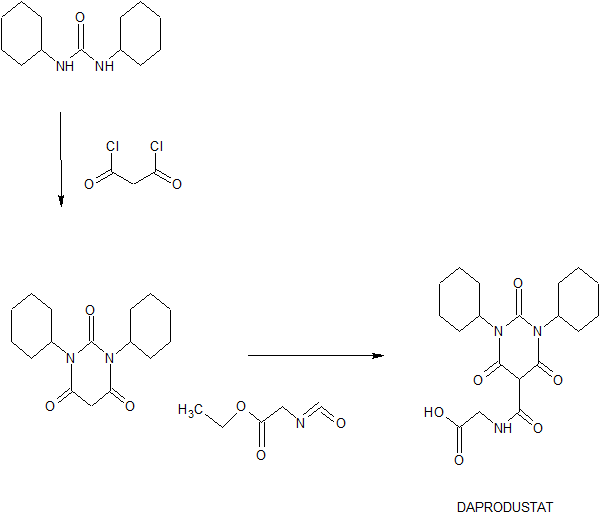 in anhydrous TΗF (700 mL) was added dropwise to a cold (0 0C) solution of malonic acid (64.1 g; 0.616 mol.) in anhydrous TΗF (300 mL) over a period of- 30 minutes. The mixture was stirred and allowed to warm to room temperature over 2 h. (After 1 h, the mixture became very thick with precipitate so further anhydrous TΗF (500 mL) was added to facilitate agitation.). The mixture was filtered and the filtrate evaporated to afford a yellow solid which was immediately slurried in ethanol (1 L) and heated to reflux temperature. The mixture was then allowed to cool to room temperature then filtered and the solid washed with cold ethanol (250 mL) to afford the title compound (129.4 g; 72%) as a colorless solid. 1Η NMR (400 MHz, DMSO-(Z6) δ ppm 1.03 – 1.18 (m, 2 H) 1.18 – 1.34 (m, 4 H) 1.59 (t, J=13.14 Hz, 6 H) 1.76 (d, J=12.88 Hz, 4 H) 2.04 – 2.24 (m, 4 H) 3.69 (s, 2 H) 4.35 – 4.54 (m, 2 H). N-rπ^-Dicyclohexyl-ό-hydroxy^^-dioxo-l^J^-tetralivdro-S- pyrimidinyDcarbonyll glycine. A stirred suspension of ethyl Ν-[(l,3-dicyclohexyl-6-hydroxy-2,4- dioxo-l,2,3,4-tetrahydro-5-pyrimidinyl)carbonyl]glycinate (159.0 g; 0.377 mol.) in ethanol (1.5 L) was treated dropwise with 6M aq. Sodium hydroxide (250 mL) and stirred at room temperature for 3 h. The solution was then acidified by the dropwise addition of 6M aq. hydrochloric acid (300 mL), diluted with water (IL) and then filtered. The crude solid was slurried in water (2 L) then stirred vigorously and heated at 35 0C for 1 h and filtered and dried. The solid material (~ 138 g) was then crystallized from glacial acetic acid (1.5 L) (with hot filtration to remove a small amount of insoluble material). The solid, which crystallized upon cooling, was collected and washed with cold glacial acetic acid (3 x 100 mL) to afford N-[(l,3-dicyclohexyl-6-hydroxy-2,4-dioxo-l,2,3,4- tetrahydro-5-pyrimidinyl)carbonyl]glycine (116.2 g; 78%) as a colorless solid. IH NMR (400 MHz, DMSO-(Z6) δ ppm 1.11 (d, J=12.88 Hz, 2 H) 1.27 (q, J=12.80 Hz, 4 H) 1.62 (s, 6 H) 1.70 – 1.90 (m, J=12.88 Hz, 4 H) 2.11 – 2.44 (m, 4 H) 4.11 (d, J=5.81 Hz, 2 H) 4.45 – 4.77 (m, 2 H) 10.19 (t, J=5.81 Hz, 1 H) 13.08 (s, 1 H).